New Zealander Rodney Russ formed Heritage Expeditions in 1985 to bring nature-lovers closer to wildlife and scenic experiences. In 1993, Russ was offered a long-term lease on an idle Russian oceanographic vessel, Professor Khromov, which he has employed continuously under the name Spirit of Enderby for more than 20 years, making many upgrades along the way. Heritage Expeditions has flown below the radar for its two decades of operation, but it has established an enviable reputation among birder groups around the world -- a feature that is still capitalised on today. With 50-passenger Spirit of Enderby still the company's flagship, itineraries are concentrated to the north and south of New Zealand in areas of exceptional natural beauty. It also offers wildlife experiences that focus on polar bears in the Russian Far East and seabirds and marine mammals as far south as the Antarctic continent. Russ is now joined by his son, Aaron, whose expedition experience extends back to his early childhood; he is now a sought-after expedition leader in his own right. Heritage Expeditions' Spirit of Enderby is one of the original ex-Soviet ships that opened up the world to commercial polar cruising more than 20 years ago. 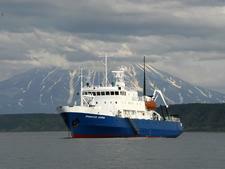 Heritage Expeditions' two vessels can be considered twins. Spirit of Enderby and Akademik Shokalskiy share virtually identical quality and format of accommodations and public spaces. A typical day on any Heritage voyage will begin with an early start, with most passengers at breakfast by 7 a.m. The committed birders will have left already to be in position at dawn. Whether it's a polar or tropical itinerary, passengers disembark by Zodiac (inflatable boat), which descends down a staircase from the upper (400 level) deck to the waterline. While passengers are out exploring for a couple of hours before lunch, the ship may reposition for an afternoon excursion. There's always time for a shower and change before pre-dinner drinks and the daily recap in the ship's bar. Dinner is typically served at 7.30 p.m., and it's followed by a documentary screening in the theatre. Often the polar itineraries involve back-to-back sea days, during which time guest lecturers make presentations on subjects as diverse as seabirds, glaciology, biology, history and geography. Passengers tend to share a common reason to be onboard a Heritage Expeditions voyage. This camaraderie makes for enjoyable trips, as everyone can mix and share with equal ease, regardless of background. It is not unusual to find passengers with impressive academic or professional credentials, usually in science fields. Most passengers are older couples in the 45-to-65 range, but younger and solo travellers are attracted to these active adventures, as well. A reasonable level of fitness and mobility is preferable for any Heritage voyage, as passengers have to get in and out of Zodiacs. There are also no elevators on either ship. Spirit of Enderby shoulders the bulk of expedition responsibility, but the company has begun augmenting the fleet with the charter of Akademik Shokalskiy, a sister ship of almost identical specification and vintage. Each ships carries 50 passengers in twin-share configuration and has a dining room, bar/lounge/library, lecture theatre and medical clinic. Akademik Shokalskiy is equally suited to the itineraries said by Spirit of Enderby, and the two vessels are often interchanged during busy seasons to East Antarctica, the Ross Sea and McMurdo Sound. The two vessels are at the smaller end of the world's oceangoing expedition fleet but have proven themselves eminently capable under even extreme conditions. In 2017, the company plans to launch a 25-metre-long, 12-passenger yacht.